Ewald and Veronica vom Schemm were friends of my parents, brought together by the hardships both couples faced during World War II in Costa Rica. Veronica told me a bit of their internment story in 2000, when I was searching for more information about my parents, Werner and Starr Gurcke. She also sent me the answers to several pages of questions I had. Veronica was British, born April 29, 1906 in Weybridge, near London, England. She attended schools there and then had 3 1/2 years training at a children’s hospital. After graduation she traveled to Costa Rica in 1934, to work as an English tutor for the children of various families. There she met Ewald, a native of Germany, at the German Club, in San José, the capital. He had been working in Costa Rica for a number of years, as a factory manager for the British American Tobacco Company. Before that he worked in Mexico. After WW II began, Ewald was no longer allowed to work for his company, although he, himself, was not blacklisted. He was told at the time that he would be rehired the moment the blacklist was lifted. The couple did not face confiscation of property, because they did not own a home or land. Since they had no children, Veronica kept working as a tutor, and her income sustained her, even after Ewald was arrested as a “dangerous enemy alien” in the first year of the war. He was locked up in what was called a concentration camp, on the outskirts of San José, the capital. She told me that on board the ship, after a miserable first attempt to have mothers and children eat together in the 15-20 minutes allowed, the children were kept below, and fed after the mothers had eaten. A handful of interned men acted as waiters at mealtime, and both my father and Ewald were among them. Armed guards prevented any communication between the men and the women, but the women neatly circumvented that restriction, by pretending to talk to each other in German or Spanish, while really talking to the men. The conversations were completely one sided, but at least the men were able to find out how their families were faring, and take messages to other prisoners down in the hold. The vom Schemms were also interned in Crystal City, Texas with us. Ewald did farm work, while Veronica assisted in the hospital. They remained there well after we were released in 1944. Once they were able to leave, some three and a half years after arriving, the British tobacco company Ewald had worked for hired him back, and they were assigned to Guatemala, where they lived for a number of years. Each summer they would come and visit my parents, but I never heard them talk about the dark days they had all endured. 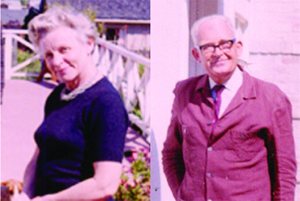 When Ewald retired, they settled in Camel, CA. Ewald died in 1983, but Veronica lived to be 99. She died January 26, 2006.